In May, we got to help bring the Crall’s Wedding Welcome Party vision to life at a private beach on the Gulf of Mexico. 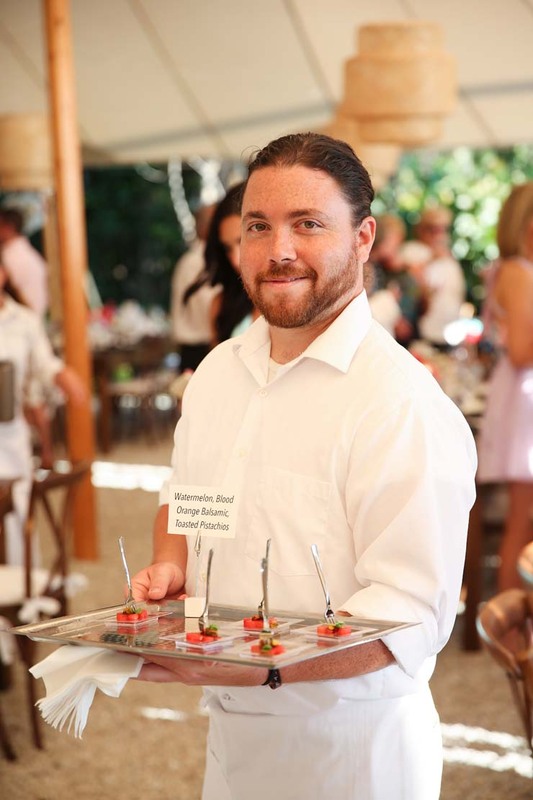 For a taste of the complete experience guests enjoyed, let’s take a look at how the Crall’s personality shined through at a luxurious destination wedding welcome dinner. A beach paradise continues to be the most popular place for destination weddings. This serene and picturesque location gives guests a vacation and wedding experience all in one. 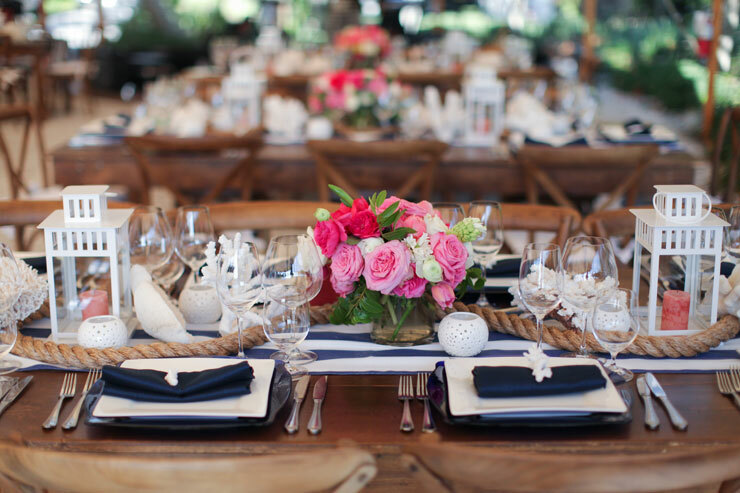 With perfect weather and a steady, cool sea breeze, the scene was set for the Crall’s wedding welcome party to whisk away guests into another world. Of course, it is all the little details that take even the most naturally beautiful space up a notch. Event planner Kelly McWilliams completely transformed the blank canvas into a stunning space where guests were able to relax and soak in the surroundings. 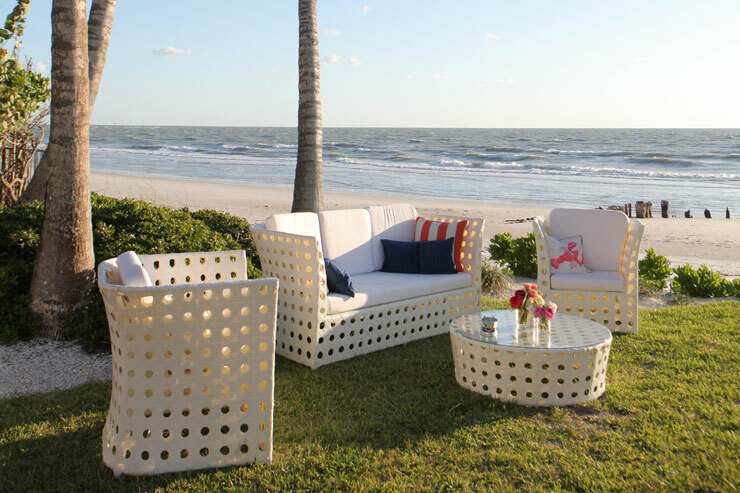 Lounge furniture placed outside the tent on the beach encouraged guests to take in the ocean at sunset while wonderful flowers by Isn’t She Lovely Florals put the final touch on the tranquil atmosphere. Tip: Destination weddings are often in rather remote locations, and parking may not be available. All the more reason to give guests the convenience of traveling via shuttle buses! This helps them arrive relaxed, so they settle right in to your beachside wedding atmosphere. Cocktails and hors d’oeuvres are your first chance to impress guests with a premium bar and artfully prepared and presented dishes that showcase local cuisine. With seafood being an essential element of a Southwest Florida destination wedding menu and customization being a given for couples working with our Naples catering company, the question was how to fuse the couple’s taste and local dishes. Because we use produce and specialty items sourced by local vendors whenever possible, infusing the local cuisine into innovative dishes that embody the Crall’s style came naturally to our culinary team. The result was the following creative small bites. After the cocktail hour ended, next up on the Crall’s welcome dinner itinerary were speeches. To keep guests satisfied through these heartwarming moments, we immediately served a plated Florida greens salad made with baby kale, arugula, Bibb lettuce, marinated baby artichokes, heirloom tomato, black radish, toasted pistachios, pistachio vinaigrette and EVOO-soaked bread. The complexity of this refreshing salad was the perfect pair to the heartfelt speeches. 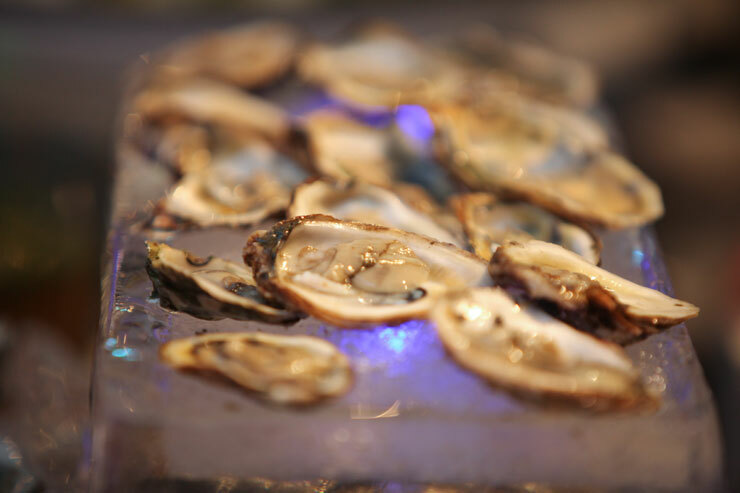 At the conclusion of the speeches, we opened a variety of innovative food stations featuring the fresh seafood that the Gulf of Mexico is known for in exciting ways that captured the essence of the Crall’s personality. At destination weddings, many couples choose to offer a fusion of local and traditional food. This is a great way to ensure everyone finds plenty of delicious dishes they love. So while seafood connoisseurs were guaranteed paradise, we made sure meat lovers found their own heaven at a skewer station. We set out delectable pineapple and chicken skewers as well as beef tenderloin skewers made with toasted farro, roquette, tomato and corn chow-chow with roasted tomato-red miso vinaigrette. With house-made hot sauce and plenty of local flare, these were no ordinary fish tacos. These mouthwatering fish tacos were bursting with flavorful ingredients like grilled fresh mahi-mahi carved station side, house-made corn tortillas, pico de gallo, pickled seasonal vegetables, fragrant jasmine rice and crème frâiche. From the number of guests that came back for seconds, you would never know we had to eliminate all cilantro due to a food allergy. Our creative chefs are always keen to find ways to accommodate dietary needs without sacrificing big flavor. Destination wedding packages are not complete until you add the value of an experienced catering company committed to excellence. 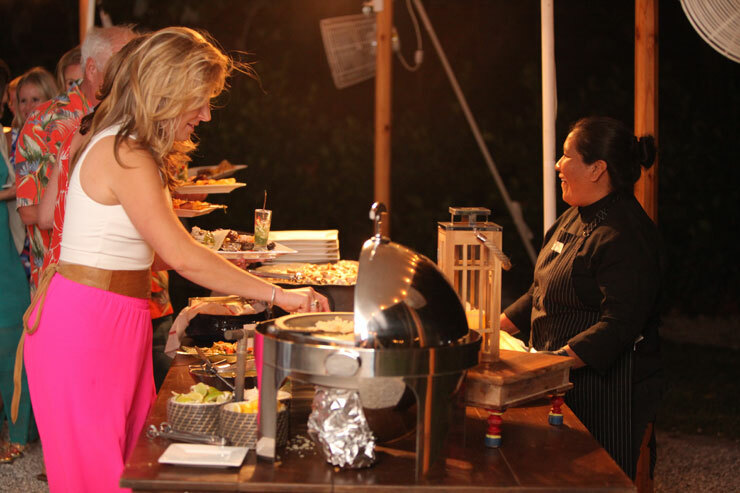 Fortunately, you can bring the expertise of the premier Naples wedding catering company to any paradise.